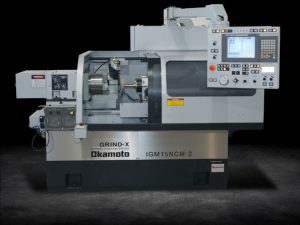 The IGM-15NCIII/2 is Okamoto’s latest generation CNC I.D. / O.D. Grinder. Rigid construction and premium components assure prolonged peak precision and long-term machine life. The new touch-screen CNC provides powerful control capabilities with ease of use. Versatile grinding capability – Straight, Taper, Faces & Multi-Step. Grind I.Ds, O.Ds and Faces in a single chucking. AC driven table with minimum feed increments of 0.00001″. Minimum infeed increments as fine as 0.00001″ diameter.